The Propeddle development circuit board with the Western Design Center 65C02S processor, the Alliance Memory AS6C1008 SRAM module, and glue logic. Not shown are the Parallax Propeller, connectors for video and keyboard, and support electronics. They will all be on one circuit board in the final kit! 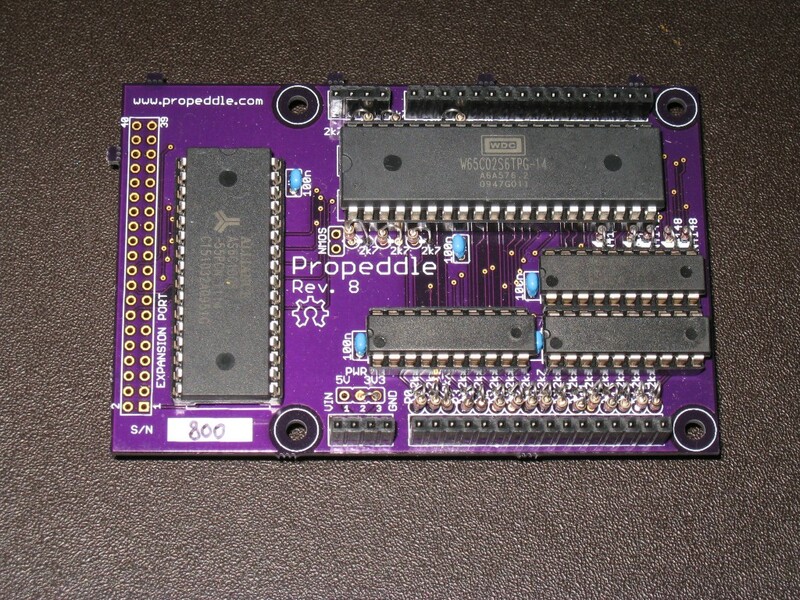 Propeddle is single-board computer, based on the 6502 microprocessor. It’s not an emulator and it’s not a replica of any existing computer — it’s something in between. It uses a real 6502 processor as CPU, and a real SRAM chip as memory. A Parallax Propeller generates the clock and other signals needed by the 6502, and it also controls the memory chip. Furthermore, the Propeller can provide video output (VGA, NTSC or PAL), keyboard input (PS/2 connector) and a serial connection. You could say that the software running on the Propeller determines how the 6502 sees the world; that’s why I use the term “Software Defined Computer”. The name “Propeddle” is a contraction of “Propeller” and “Peddle”, in honor of Chuck Peddle, one of the engineers who designed the 6502. Don’t worry, Bill Mensch will also be honored, in a future product! Once the design is finished, you’ll be able to purchase Propeddle online as a kit, probably via Tindie. Those who don’t want to buy the kit or want to make some modifications, can build their own: All schematics, PCB designs and software will be open source, distributed under MIT License via GitHub. All components are through-hole so you can even build one on a breadboard. There are no PALs, GALs, CPLD’s, FPGA’s or EPROM’s in the circuit, so you don’t need any special hardware to get started, other than an FTDI cable. Once the final PCB design is done, I’ll probably make all those items available (except the computer 😉 ) or I’ll post links to where you can get them. Propeddle was inspired by the Prop6502 project by Dennis Ferron, for which he got an honorable mention in a Parallax contest in 2008. Thanks for sharing, Dennis!